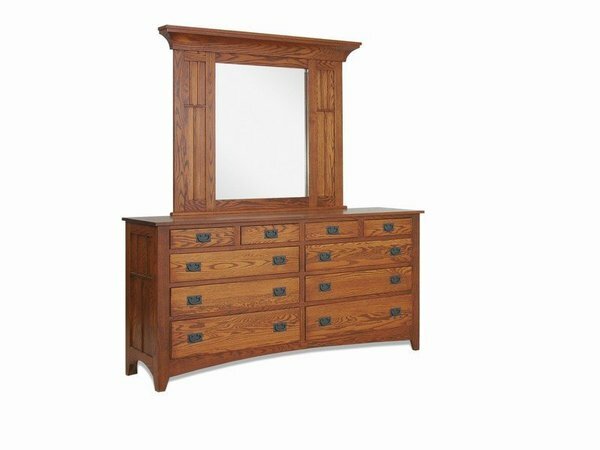 The Amish Furniture Solid Wood Craftsman Mission Triple Dresser is inspired by the Arts & Crafts movement of the early 20th century. This Mission dresser will blend with most home decors. This distinguished Mission dresser is handcrafted of 100% solid oak wood or cherry wood. Made in the USA! This Amish Furniture Solid Wood Craftsman Mission Triple Dresser is well designed and stylish with clean lines, carved panel sides and drawers that show off the solid wood grain. Choose between black or wood Mission hardware. The drawers are dovetailed for years of everyday use. It is available in oak or cherry wood and handcrafted by experienced woodworkers in Lancaster, PA. Give your bedroom the look and comfort of a village inn with the Amish Furniture Solid Wood Craftsman Mission Triple Dresser.